We’re always working hard to be the best home builder we can for you. 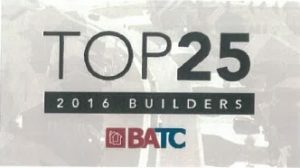 And in 2016 our hard work paid off again as we were named a Top 25 Home Builder by the Builders Association of the Twin Cities (BATC) for the second year in a row! The rankings for the home builder award are based on annual gross revenue for home sales. At Progressive Builders, we’re proud to have grown to $24.94 million in gross revenue for the sale of 104 single family and 2 multi-family homes (106 total) for the 2016 calendar year! That’s growth of about $6.8 million, which shows how much you trust us to provide the best home for your family! On the Top 25 Home Builder list, we’re listed at #18, up three positions from #21 last year. Thank you for your support! If you’d like to be part of the excitement and build your own home with us, check out our homes for sale, new floor plan designs, take a shot at designing your own home or let us know if you have any questions! At Progressive Builders, it all starts with a passion for serving our clients. Through hard work, dedication, a commitment to quality and passion for serving their customers, Progressive Builders has become a leader in the residential construction industry. Our goal is to provide families just like yours with new construction homes which meet your needs as well as our high standards for quality construction. Throughout the northern and northwestern Twin Cities Metropolitan Area, Progressive Builders continues to deliver on our promise to customers. We take our commitment to every customer personally, and because of this we have earned a reputation as one of the top builders in the state. The BATC started in the 1930s with the goal of increasing professionalism and home builder standards and quality. Every member follows a code of ethics and conforms to performance standards set by the industry, while also being licensed by the state of Minnesota. As a home builder, we benefit by our membership in the BATC through their curation of the Parade of Homes, in which we always have a few homes. They also advocate for home builders like us at the local, state and regional level with legislators and governmental agencies. Contact us today if you’d like to work with a Top 25 Home Builder on your next home!